Fix parser for Option 8: Download new illust from bookmark. Update download by member id to accept comma-separated list from console. Update download by image id to accept comma-separated list from console. 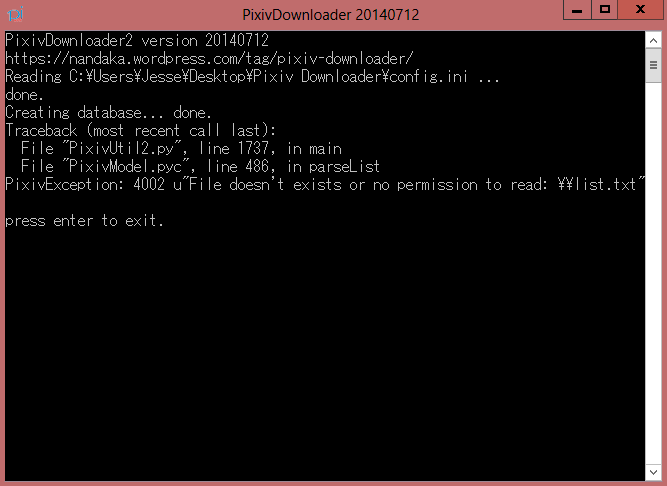 Download link for pixiv downloader 20140712, source code in GitHub. I also have a problem when downloading multiple images. The downloader having no problem downloading image id that contain single image, but having problem downloading image id that contain multiple image. Here’s an extract from the log of a session where I tried to download a 3-page manga, after some retries it ends skipping the pages one by one. 2014-09-25 15:41:35,707 – PixivUtil20140712 – INFO – Image id mode. I can confirm. Having the same problem with manga downloads. Can you add it to the GitHub issue? Done, since other users are reporting the same I can see the issue happens to everyone. but , how does it exactly work ? step by Step i mean , what should i do after downloading that file ? extract the file and read the readme.txt, then run the app. Can you set your pc locale for non-unicode to Japanese? Thank you very much I’ll use it well! do save the list.txt in the same folder with the exe (C:UsersJesseDesktopPixiv Downloaderlist.txt)? 1. Create list.txt on the app root directory, separate each id with new line (see readme.txt for details). but i can login using browser. Try to delete the cookie in the config.ini and retry? Maybe I’m just fretting over nothing, but is it known how far you have to push it in order to get banned from Pixiv? Their ToS apparently forbids the use of crawlers and other programs to harvest images. I’ve never thought about this before, even though I’ve been using this awesome downloader on-and-off for a few years now. Looking at my list of backlogged artists, I still have another 150 or so to go through (out of 460). Despite pacing myself by grabbing 10-20 every day or every other day, I’m still kind of concerned that I might be overdoing it enough to get on their radar. Usually I’m doing almost 100 , but only single instance (1 app running) on weekly basis and it is fine so far. I downloaded near 150gb of images over the course of a month or more. I didn’t get banned. Just wanted to chime in. I’ve downloaded 550GB worth of images from roughly 7,000 bookmarks over the course of a year or so. I go through that entire 7,000 bookmarks on a weekly basis (sometimes more often) and have yet to be banned. I think it’s safe to say they are pretty lenient when it comes to this. I think Pixiv Downloader grabs stuff slow enough that they don’t catch it at a typical crawler which generally slams websites with dozens of simultaneous download requests. People who visit the site via their browser and open up a bunch of tabs to download lots of pictures at once probably do more damage than Pixiv Downloader. I keep hitting this error no matter how many times i’ve tried this program. Am i searching for too many tags or something? theres close to 22000 pictures all up when i search either like this or with a tag list it comes up. http://puu.sh/ayGnh.html here it is, becuase of the length of the lags i couldn’t get it to save that file, but same error happens here anyway. Try to delete the cookie and set keepsignedin = 1 in config.ini and retry the download? 2014-08-01 14:14:57,039 – PixivUtil20140712 – INFO – Taglist mode. can you try to download the image id: 44210188 directly (use option 2)? The failure happen on the image page. problem on the image parser, but I can download just fine… What is your language settings in the pixiv website? Only english and japanese are supported. I think i figured out the cause, I created a second account and it’s working perfectly, checked my settings, all the same. Though my main account has PixvPremium is it possible this caused it? might be. I don’t have premium, so I cannot test it. When downloading by tag I get ValueError: invalid literal for int() with base 10: . I tried to follow the read me, which told me to copy paste some code into the html.py, but I can’t find where to put the code. Notepad & notepad++ makes the code look like a mess and using the search function isn’t helping. I guess a must be missing something obvious, i’m not great with computers. Sorry about this. the .pyc is the precompiled python file, so you cannot edit this easily. You should edit/replace the .py one. Mine is in the Python27Libmechanize folder. Btw, what is your python version? I’m still using the 2.7.x version. If you download the compiled version (assuming you are using windows), you don’t need to do anything. I’ve been trying to edit the file in the library zip that came with the pixiv tool. Have a been mistaken? I’m using windows 7 and python 2.7.8. I looked in the programs folder for python 2.7.8 but couldn’t find the mechanize folder. Folders that begin with M in the “Lib” directory are mslib & multiprocessing. The “libs” directory only has .lib files. What compiled version are you referring too? A compiled version of the file you put on pastebin? A compiled version of python 2.7.8? Because I do not know where to get either. By right, you don’t need to edit the library.zip from the mediafire link, that’s the compiled version already. Anyway, just tell me the member/image id that have the issue. Also, make sure the language settings in the pixiv website is set to english or japanese. http://www.pixiv.net/member_illust.php?mode=medium&illust_id=44904661 since the more recent ones did download. – I’m not able to show members and images from DB menu. In fact, I can’t use any of those options. How do make it work? – I tried creating blacklist_tags.txt (tags for each line, saves with UTF-8 encoding) however it won’t block any images that is associated with the tags I’ve included in the list. Am I doing it correctly? – Relates to question above but do I create other .txt files such as list, tags and surpress like I’ve done for blacklist? Anyone? I really want to blacklist “ugoira” when downloading via option 8. Check the readme.txt for more details. Alright I figured out how to do it! Thank you for your help and for making such a useful program! Hello! I’m sorry for my ignorance, but I’ve never used programs like this before. Every command I insert doesn’t seem to be working. I put “Download by member_id 00000”, “-s Download by member_id 00000”, “-s STARTACTION Download by member_id 00000”, “-s STARTACTION 1 – Download by member_id 00000” and I keep trying all sorts ofdifferent variations of the command and nothing seems to work. I’m sure I’m doing something glaringly wrong, and I apologize, I haven’t used command boxes before. What are you specifically word for word supposed to insert? I’m typing in “pixivutil2.exe -s 1 888880” (artist I’m trying to download) and press enter afterwards, and it still doesn’t seem to work. It reloads the introductory text after each attempt. I tried other commands like “pixivutil2.exe -h” and variants to see if I could get it to work but none have so far yet. Again I’m sorry for not knowing what I’m doing and thank you for your time! can you run it normally (double clicking the exe) and make sure the config.ini is set properly (check the readme.txt). If you don’t set the username/password in the config.ini, it will ask you for the input. I double click the PixivUtil2 in the file folder which opens the command prompt. It wouldn’t let me type in anything for my password – nothing would show up, so I had to set my username and password in the config file so it would automatically log me in. I also had to set the userobots to False because it was giving me an error message. After I insert any command it doesn’t give an error message or acknowledge I sent a command, it reloads the introductory text. I’m going through the readme right now and making sure the config settings are correct, and I’ll keep messing with commands to see if I can get one in right. The password will not be shown when you key in from the ui. Just type it and press enter. Also, make you use the normal number (not the double width character, but ascii) when you key in the command (key in ‘1’ after the application loads and ask for input). Never mind, should have read a bit further before asking. I think I recall that this had been fixed in the past. Would it be possible to get it fixed again? Thanks! can you log it to github issue tracker and provide the image id? Fyi, this issue might happen again if pixiv change the website layout/css, as I’m using parsing technique to get the images (not using api). That happens when I put my pixiv password.What I doing wrong or who can I fix it? Thanks in advance! I cannot log in using form. Apparently there’s a problem with robots.txt (error 406) that doesn’t allow me to log in. is this a known problem? anyone could give me a hand ? sorry if I write here, but who should I contact for questions? “Update download by member id to accept comma-separated list from console. How does it work exactly? I can now enter option 1 or 2 and then type a series of profiles or image_ids (writen like: 12345, 54321, 34521) so that they are downloaded one after another? crap, the readme is correct. If you run it from command line directly using options switch, it require space, but if you run it first (e.g. by double clicking it, then enter the option after the menu show up, it require comma.